The five back slats have the same curve as the upper part of the back legs. Then transfer the curve of the top of the back leg — front edge only — to this blank. lay out mortises. Before cutting the leg to shape, it's easiest to first lay out all the mortises. Then drill the mortise in the edge for the side seat rail (while the opposite edge is still straight). see detail on the leg pattern and also Fig. 1.
first leg. After the mortise is drilled, I cut the first back leg (A) to shape in two stages. First, I bandsawed the curve to within W of the pencil lines. Then I sanded up to the pencil lines to smooth out the curves. Also transfer the location of all the mortises. 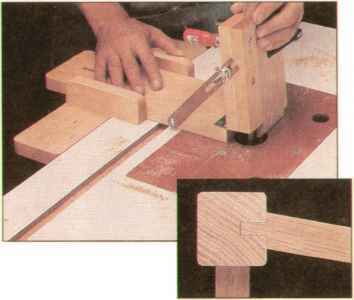 Then drill out the mortise for the side rail, see Fig. 1. Now the second leg can be bandsawn to rough shape and sanded to match the first. 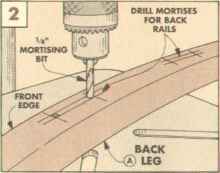 drill mortises. 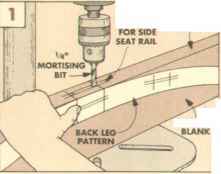 When both back legs are sanded to the same shape, the remaining three mortises can be drilled on the side of each leg, see Fig. 2.
handsaw. Now band saw to within Vi6" of the pencil mark, then sand the curve smooth up to the pencil mark. 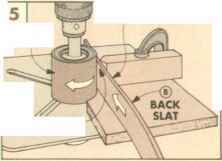 To cut each of the five back slats (B) to the same shape and thickness, I used a pointed rub block on the band saw table, see Fig. 4. To use the rub block, first clamp it Vi6" from the side of the blade. 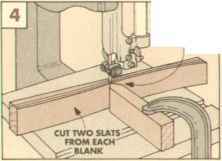 Then, push the workpiece through the saw with the curved front edge of the workpiece sliding across the point of the rub block. This slices off one of the back slats like a slab of bacon. thickness sand. When all the slats have been cut out, sand them to finished thickness (V4"), see Fig. 5. Then rout a Vfc" round-over on all four edges. ALL SQUARES 1- x 1"
How to cut out rocking chair legs?